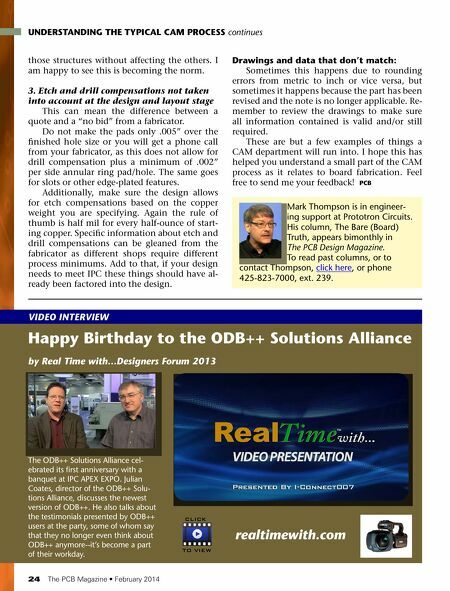 24 The PCB Magazine • February 2014 UNDERSTANDING THE TyPICAL CAM PROCESS continues those structures without affecting the others. I am happy to see this is becoming the norm. 3. Etch and drill compensations not taken into account at the design and layout stage This can mean the difference between a quote and a "no bid" from a fabricator. Do not make the pads only .005" over the ﬁnished hole size or you will get a phone call from your fabricator, as this does not allow for drill compensation plus a minimum of .002" per side annular ring pad/hole. The same goes for slots or other edge-plated features. Additionally, make sure the design allows for etch compensations based on the copper weight you are specifying. Again the rule of thumb is half mil for every half-ounce of start- ing copper. Speciﬁc information about etch and drill compensations can be gleaned from the fabricator as different shops require different process minimums. Add to that, if your design needs to meet IPC these things should have al- ready been factored into the design. Drawings and data that don't match: Sometimes this happens due to rounding errors from metric to inch or vice versa, but sometimes it happens because the part has been revised and the note is no longer applicable. Re- member to review the drawings to make sure all information contained is valid and/or still required. These are but a few examples of things a CAM department will run into. I hope this has helped you understand a small part of the CAM process as it relates to board fabrication. Feel free to send me your feedback! PCB Happy Birthday to the ODB++ Solutions Alliance by Real Time with...Designers Forum 2013 the odb++ Solutions alliance cel- ebrated its ﬁrst anniversary with a banquet at iPc aPex exPo. Julian coates, director of the odb++ Solu- tions alliance, discusses the newest version of odb++. he also talks about the testimonials presented by odb++ users at the party, some of whom say that they no longer even think about odb++ anymore--it's become a part of their workday. realtimewith.com CliCk To View vIDeo InTeRvIew mark thompson is in engineer- ing support at Prototron circuits. 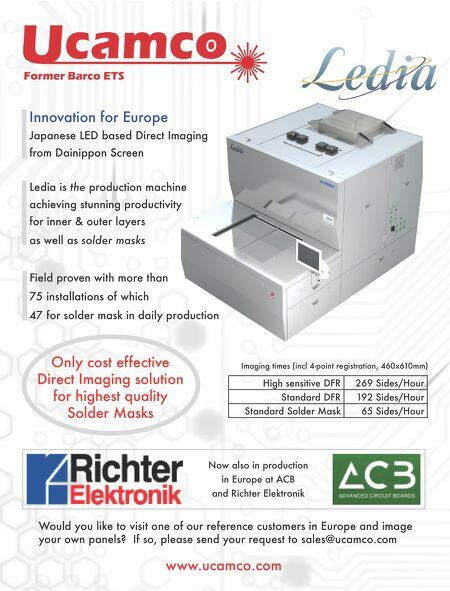 his column, the bare (board) truth, appears bimonthly in The PCB Design Magazine. to read past columns, or to contact thompson, click here, or phone 425-823-7000, ext. 239. Short — 3D Printing: The New Frontier? Column — Are Boringly Predictable Operations Possible?